I hope you and your families have a wonderful Easter celebration. We are prepared for a very low key holiday. We complete Easter week services this morning, then head to an aunt's for a small, picnic-style lunch. I am bringing the ubiquitous deviled egg tray, the sugar-free, no-flour brownies, and a platter of steamed asparagus with curry dip. 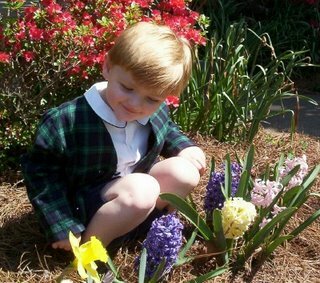 I love the way the sun is shining on your little boy, and his smile as he looks at the flowers. Cute, cute! I love little Easter/spring suits.